Using the left hand navigation, navigate to "Settings". In the filter, type Defined STEM. Select Defined STEM from the results. On the overview page, select "Add App". In the popup, enter the consumer key and secret provided by your administrator or by our implementation team. If you do not have a consumer key and secret, please contact your administrator. After the pop up fades away, navigate to the "View App Configurations" above the External App list. Click the button with the pencil icon. For the best experience, set the privacy to "Public". For some privacy, but still a good experience, use "E-mail Only". "Anonymous" and "Name Only" usage will not save results to your individual Defined STEM account. Defined STEM has now been added to your Canvas Course! To begin, the Defined STEM app must already be added to your Canvas as per the instructions above. Your technology team may have completed this step for you. Using the left hand navigation, navigate to "Modules". Press the button "+ Module". In the module pop up, enter a name and press the "Add Module" button at the bottom. Your module will appear and have three icons. To add a link, press the "+" button. In the pop up, change the dropdown to "External Tool". If correctly configured, there should be an icon resembling a magnifying glass next to Defined STEM. If this icon does not exist, the app will need to be reinstalled to have this ability. Upon selecting Defined STEM, another pop up will appear with a miniaturized version of the search tool available within Defined STEM. All Defined STEM and customized resources are available through the resource browser. 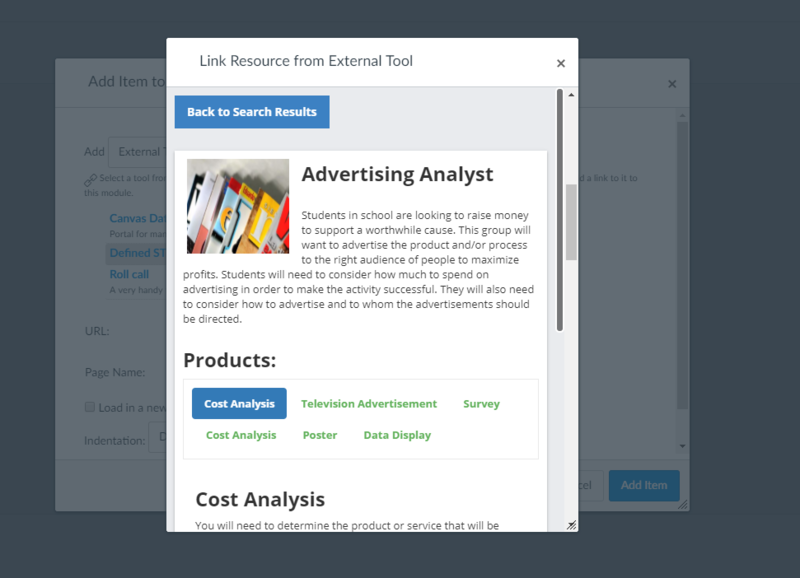 Press the "Preview" button to receive a quick overview of the resource. When the desired resource is located, press the "Select" button to select the resource. After selecting the desired resource, the selected information is displayed in the external tool pop up. From here you can change the page name, which changes the link text and you can select to open the link in a new tab or open the resource in the current tab. 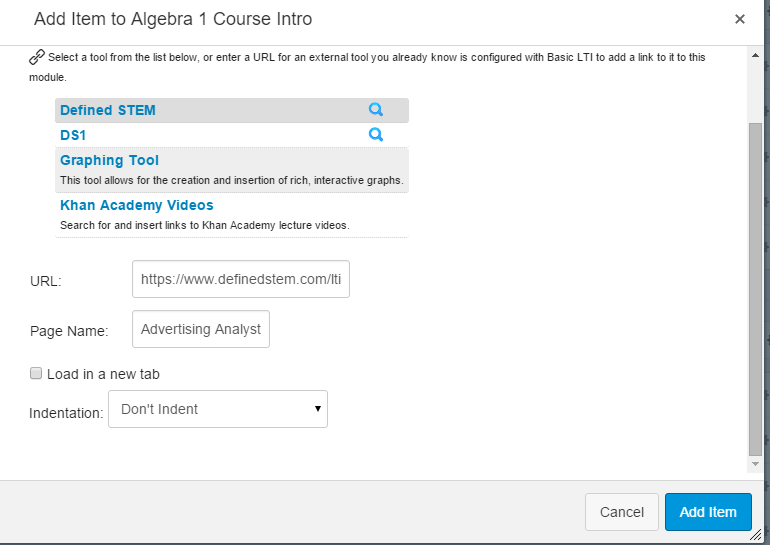 Upon returning to the page, a link will to the resource be generated and added to the module, this link will automatically log students/teachers into Defined STEM and take them to the resource. Wherever there is a Rich Text Editor, there will be a button with the Defined STEM logo. Press the button to bring up a smaller version of the search tool that is available within the site. 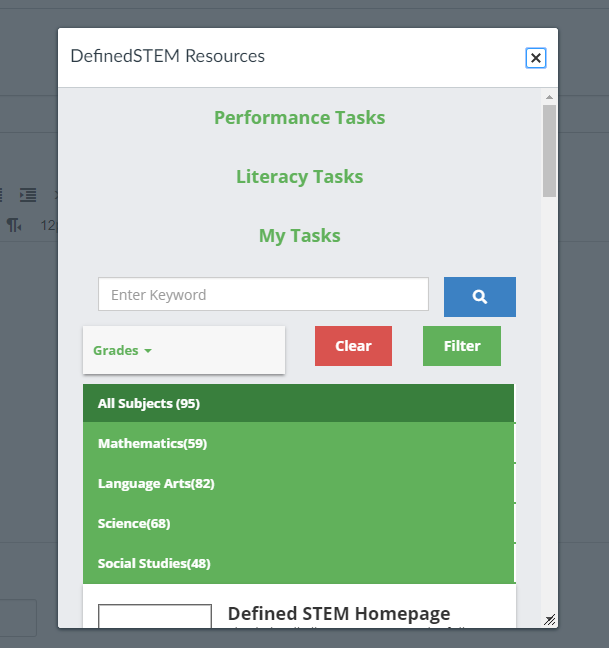 All Defined STEM and customized resources are available through the resource browser. When the desired resource is located, press the "Select" button to select the resource and return to the editor. Upon returning to the editor, a Defined STEM link will be generated. This link will automatically log students/teachers into Defined STEM and take them to the resource.